I have been skipping rice for tarts lately...I have this sudden craze for pies, tarts and quiches. I will make the dough a day so that I can have tarts or pie for my dinner. When I saw this recipe on Shannon's blog - Just as delish or better, I knew straight away what I want for dinner LOL! 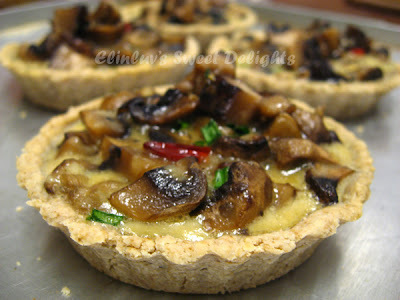 Well, I love mushrooms especially the white and brown ones and what more a gluten-free crust ! So healthy a dinner for me and supper for Wild Boar. When I first heard of gluten-free cake, gluten-free bread and other gluten-free bakes....I was like ...not interested and I thought, well, it will taste good but after trying this gluten-free oat crust....I have to retract my statement ! It is in fact yummy....crunchy and has a oat-y fragrant . I know not many people likes oat but for me I do love it! Not only it is fibre packed but it has a very nice crunch. 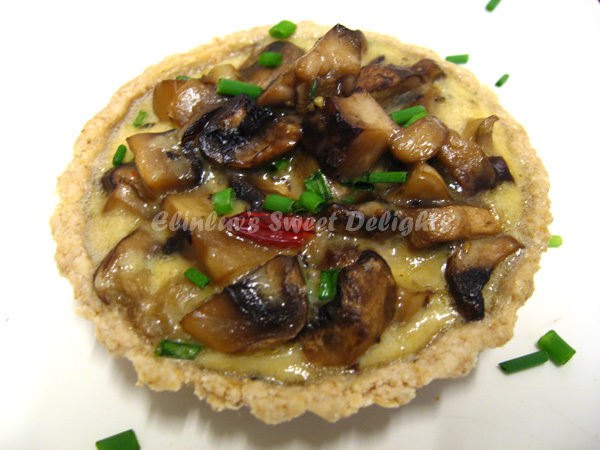 Topped with the flavorful sauteed mushrooms and egg mixture...it resembled a mini quiche in fact. 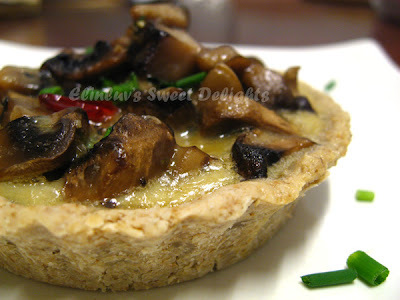 Thumbs up for this mushroom tartlet ! You can whip this up in just under an hour. 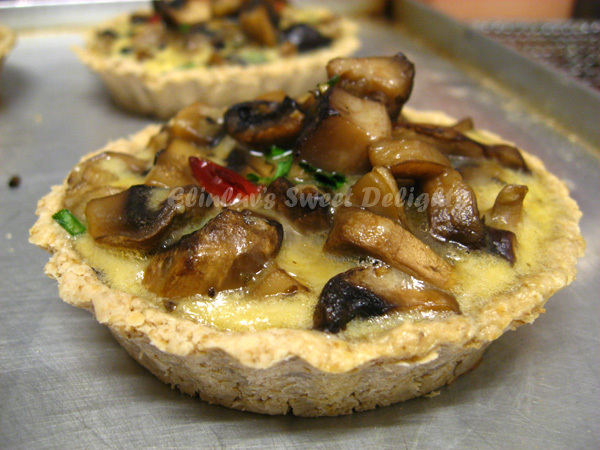 This mushroom tartlets are great as appetizer , light lunch or like I had it for my dinner when I want something simple and light. Love the fillings which is not rich unlike the quiche . The baking time is just 10 minutes before adding the fillings and 10 minutes after. It is best to serve them warm, the crust does become soft after a while. Shannon suggested that we can make them in bigger batches, freeze them and pop them into the oven before eating. Gluten-free crusts do not have the same texture as regular doughs , so you can't roll them . You have to press them into the muffin tray or tart molds. For the oats flour , I grind my regular oatmeal ( not instant oats ) in a food processor until it becomes fine flour, mix with olive oil and press them into my tartlet mold. It is easy and doesn't take up much time. Oat flour doesn't make a flaky crust, but crunchy . 1. Grind the oats in the food processor until it becomes fine flour. Add in olive oil, water and salt and mix well until the dough isn't dry anymore. 2. Take 2 tsps of dough in your hand and press them into the muffin tray with your fingers to fit to make a tartlet shell. Continue with the rest of the dough. 3. Bake for 10 minutes at 350F or 175C. 2. Heat up pan with olive oil on medium heat, saute mushrooms and tomato for 2 minutes. Add dried basil, salt and pepper to taste. Set aside. 3. Add milk to beaten egg, and whisk until well mixed. 4. When the crust is ready, take out the muffin tray. 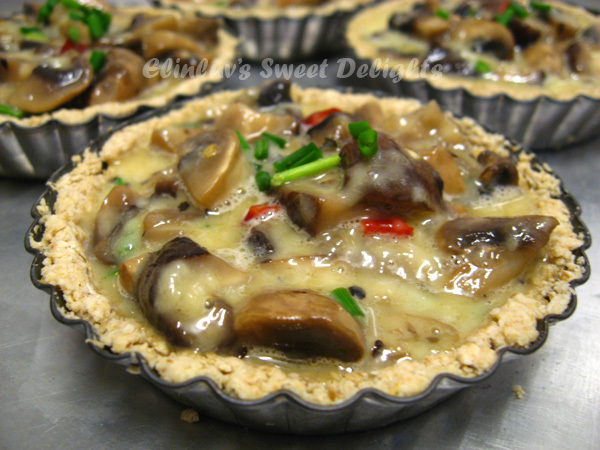 Fill the tarts with sauteed mushrooms, grated cheese and egg mixture. 5. Bake for another 10 minutes at 350F /175C. Serve warm. Hmmm...I can see why you like these, they do look very delectable and if they are healthy, that's an added bonus! Fabulous idea as Gluten-Free flour blends are twice the price of regular flour here. The oat crust alone is already amazing and then this heavenly looking fungus topping! Spectacular! I usually stay away from the gluten-free parts of recipes, because I'm not gluten-free, but this crust looks and sounds SO delicious. I love the idea of using the oats mixed with olive oil. Any mushroom recommendations in particular? Or just plain button is fine?